Megan is a 4th generation Brookings County, South Dakota native. Although her time in Boise Idaho was a combination of educational fun through commercial real estate, cutting horses and friends, she is glad to return home to South Dakota amidst family, new and old friends, and the family business. Her roots run deep in farming and ranching through her great Grandpa Fred and her parents, in banking and real estate through her Grandpa H.E. and Uncle Chuck Hegerfeld. Being a close knit family, Megan knows the value of service and it is her goal to serve with the level of excellence that has been modeled from her family. Megan is a licensed land broker, auctioneer, bid assistant and land manager in South Dakota and Minnesota. 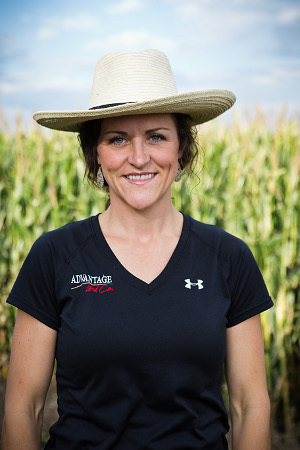 Since 2008, she has sold row crop farms and ranches across South Dakota and Minnesota including corn, wheat, soybean, and sunflower farms along with a variety of cattle ranches, range land and recreational hunting land. Knowing the power of two, Advantage Land Company and United Country, Megan uses the most beneficial marketing techniques of both to develop unique solutions for each land owner/seller. She also is versed in live auctions, online auctions, and traditional real estate listings and uses each or a combination to meet specific needs of her clients. She graduated with honors from Mount Marty College in Yankton, South Dakota, with a degree in Business Management and Marketing, and was part of their fast pitch softball team all 4 years. Megan currently aspires to obtain designations offered through ASFMRA and the NAA and her involvement with SDAA, NAA and United Country will continue to build a network of friends and associates growing her personally and ultimately helping those she serves. Spending time with her family, including her husband Lane and daughter Josephina, gardening, sewing, walking, biking and riding horse are just a few things she enjoys. In her spare time she enjoys the experience of livestock auctions, especially the Fort Pierre Livestock Barn with a good west river ranch friend. She is an active member of the worship team at Gracepoint Wesleyan Church in Brookings South Dakota.